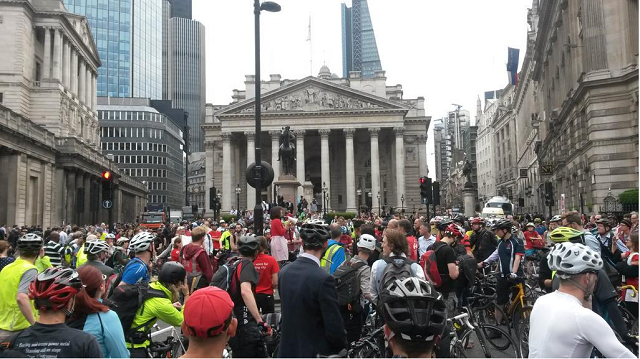 Cyclists brought Bank to a standstill as they protested following the death of a young woman there on Monday. “London's cyclists will continue to die until decisive action is taken,” said Ashok Sinha, CEO of London Cycling Campaign. A mother and daughter were killed by a train at Ealing Broadway. One teenage boy has been stabbed outside a school in Lewisham. ...And here's a timely look at parts of London that have vanished or may vanish soon. Anyone have a spare room for Her Maj: she may have to move out of Buckingham Palace (poor petal). Do you live in one of the 'happy' bits of London? Brixton mural of David Bowie covered up by Popcorn company branding — to the irritation of residents. Boris Johnson picks on a man in a wheelchair. Sol Campbell gets serious about how to solve London's transport problems.